It's getting tougher before it gets easier. 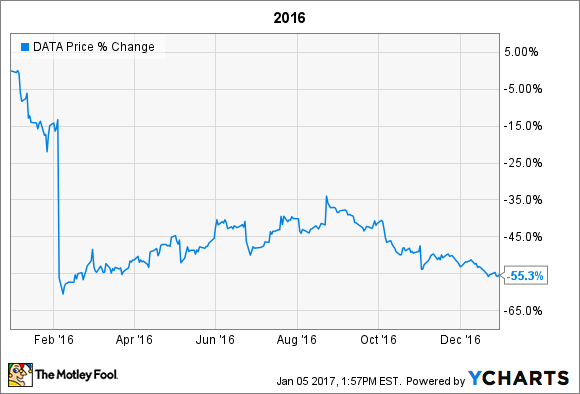 There's no way to sugarcoat it: Tableau Software (NYSE:DATA) had a horrible 2016. Shares lost over half of their value, with most of that decline occurring in February when the data-visualization specialist reported disappointing earnings alongside weak guidance. A handful of big-data stocks got crushed that day, as investors feared Tableau's woes were not isolated to the company itself, but instead potentially spelled trouble for the sector. Tableau investors are no stranger to volatility. Zooming out a bit, shares have been on a bona fide roller coaster ever since the 2013 IPO. Unfortunately, the company may also have a rough 2017 ahead of it. Wunderlich Securities analyst Bill Choi has just downgraded his rating on Tableau shares (via Tech Trader Daily) from buy to hold. The analyst's price target is also getting cut from $58 to $50. The main reason for the pessimism is an expectation that competition from much larger rivals Amazon.com (NASDAQ:AMZN) and Microsoft (NASDAQ:MSFT) is going to intensify further this year. While Tableau still offers strong visualization and analytics, the broader shift away from on-premise deployments toward cloud-based services poses a potential threat, since most of Tableau's revenue is generated through on-premise deployments. If Tableau's biggest differentiator is visualization and analytics, it shouldn't take much time for Amazon and Microsoft to cut into its business in short order. Meanwhile, the e-commerce and software giants both have far greater scale and a wider breadth of other offerings that translate into lower costs and deeper relationships. Choi notes that AWS QuickSight (which he accidentally refers to as QuickShift) costs just $9 to $18 per month per user (standard versus enterprise users); Amazon launched QuickSight in October 2015. Microsoft's Power BI undercuts even more aggressively at $0 to $10 per month per user (Power BI versus Power BI Pro). In contrast, Tableau Online costs nearly $42 per month per user. While Tableau Online is a higher-end offering with more features to justify the premium, QuickSight and Power BI are only going to expand their own feature sets from here. At a minimum, it seems that Tableau will need to discount in order to score the bigger enterprise contracts, which will hurt pricing power and margins. There are some signs that Tableau is already doing so, but management isn't too concerned overall. The general arc of the year is that the space has become more competitive and Tableau has needed to show more flexibility engaging with enterprises. Those are broad arcs of our business trajectory, but not the one that I would point as, 'Oh, yes, that's the reason we didn't close quite as many in Q3 as we wanted to.' In fact, of the ones that we didn't pull in that we thought we would, they're all actively worked in Q4. In fact, some have already closed in October. Chabot did acknowledge that Tableau has needed "more discounting flexibility." The company's success naturally attracts competitors, but Chabot thinks that the market is growing so fast that there will be room for several players to be successful. Still, with competitive pressures from gigantic rivals mounting, Tableau will have an uphill battle this year if it wants to satisfy investors.